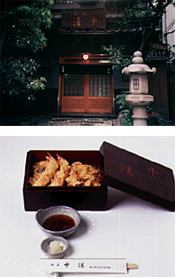 Founded in1870, Nakasei has carried on the tradition of Edo-style tempura for six generations. Whereas tempura usually consists of deep-fried seafood and vegetables, Edo-style tempura serves nothing but fish and shellfish caught in Tokyo Bay and deep-fried in aromatic sesame oil. Nakasei’s exquisite tempura has often been celebrated in the works of famous Japanese writers. Our restaurant, with its stone lantern and entrance evocative of old style store houses, has a lunchtime dining section with tables and chairs. Further back is a courtyard with a pond and beautiful garden, and around the courtyard are twelve private dining rooms styled after tea ceremony rooms and available for either lunch or dinner. If you are new to Japan and Japanese food, then the delectable flavor of Nakasei tempura is a good place to begin. Many foreigners have become regular Nakasei customers.